Natural gas (generally pressure regulated pipeline or wellhead gas) conversion into LNG takes place at gas temperature of -260°F (-162°C) and pressure of approximately 4 psig. Large energy consumption required to achieve cryogenic temperatures can be substantially reduced by utilizing the available at letdown facilities pressure differential to precool LNG feed. Per UVI’s arrangement a separate pressure regulated gas flow cooled by a combined Joule-Thomson and vortex phenomenon is applied to precool LNG feed gas. The core of this UVI technology is the non-freeze (self-heating) Vortex Pressure Reducer (VPR). The VPR configured as Dual Stream Vortex Tube (VT) operates as a primary pressure regulator of non-preheated pipeline or wellhead gas. The high pressure pipeline gas at 800 psi (54.5 bar) and 40°F (5C) undergoes non-freeze pressure reduction and the subsequent energy separation in the Self Heating Vortex Tube forming two outlets: cold at negative 71°F (-57°C) and hot at 93°F (34°C). 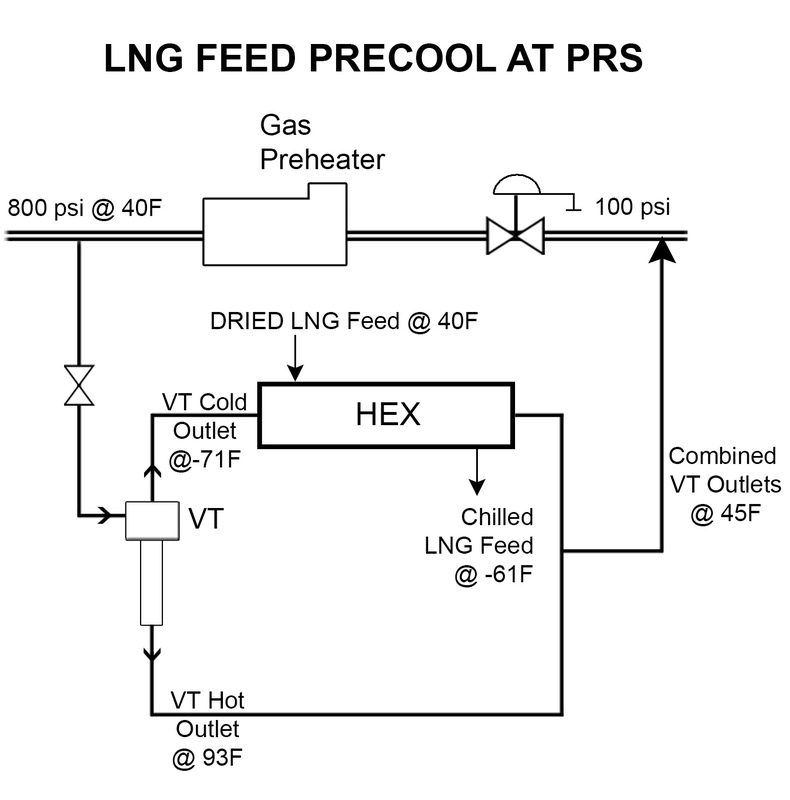 The VT cold outlet at -71°F is heat exchanged (HEX) with the, taken upstream of the PR and previously dried, LNG feed. Assuming the use of a HEX with a conventional 10°F (5°C) thermal approach the LNG feed comes out of the HEX at -61°F (-52°C). After cooling the LNG feed flow, the VT cold and hot outlets are then combined and the combined flow at some 45°F (7°C) is dumped into the PRS downstream pipe. Since the VT flow is substantially smaller of the pipeline gas flowrate, the VT discharge pressure will adapt to the downstream pipe’s pressure. Energy saved: -61°F – (-260°F)/40°F – (-260°F) = 0.66 Saving 34% of Energy Required to Produce LNG! In the course of vortex LNG feed precool, VT flow is always just a portion of gas main flow passing through a Letdown facility; the technology also provides for no single cu. ft. of VT gas flow lost in operations. There is no practical limit on vortex tube gas flow rate and pressure in the vortex LNG feed gas precool.